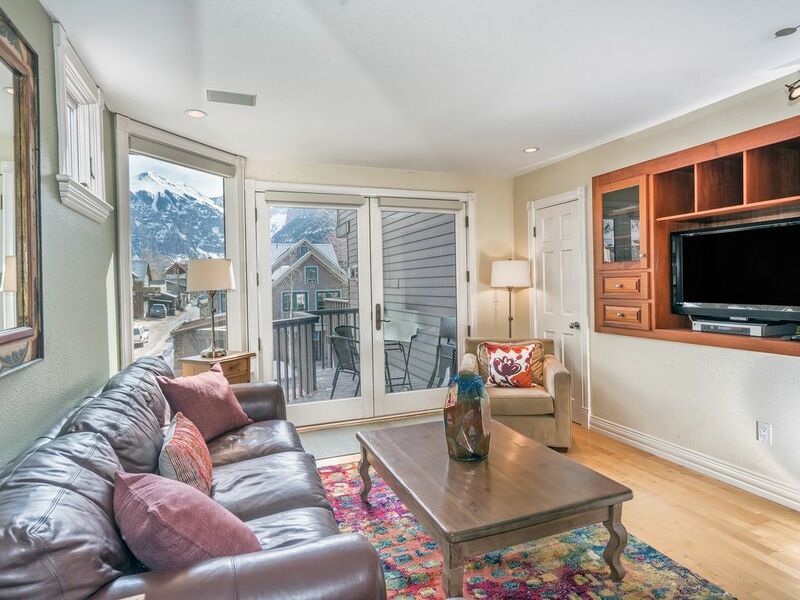 Offered at an exceptional value, Cornet Creek Condo is a three bedroom/two bathroom, split-level condominium located in the Town of Telluride. Cornet Creek Condo has easy access to skiing in the Winter, just 1.5 blocks from the Coonskin lift (Chair Lift 7) and 3 blocks from Chair 8 and Telluride's free Gondola transportation to Mountain Village. And in the Summer just 5.5 blocks to the Telluride Festival Grounds via the scenic San Miguel River Trail. No car necessary, you can walk to everything! Cornet Creek Condo has been upgraded with flat screen TV in Living Room, new duvet covers in all bedrooms (just ordered), new lamps and textiles. This vacation rental features 3 guest bedrooms and 2 bathrooms and is perfectly configured for couples or a family, with bedrooms nicely spaced for privacy. • Luxurious kitchen including stainless steel appliances, walnut cabinetry and granite countertops. Open and adjacent dining area overlooking peaceful Cornet Creek. - Daily and midweek cleaning, private chef and catering services are available at the guest's request. Transportation: No car is necessary at this vacation rental because everything is within walking distance. Telluride's free Galloping Goose shuttle is steps out your door and circles around the Town of Telluride every 15 to 20 minutes. Telluride is amazing in the winter, summer and fall. This is truly a charming accommodation with great location. In 1974 I set out to explore the beautiful Rocky Mountains. I found myself in Telluride, a historic Victorian town nestled in the San Juan Mountains of southwest Colorado. Telluride captivated me from the very beginning, and I have made this community my home for over 40 years. I recognize the importance of giving back to the community that has cared for my family and friends over the years. I have devoted myself to Telluride throughout my entire adult life, actively engaging in community events and participating at the local level. I have proudly served on numerous Boards, Committees and Fundraisers. The Town of Telluride is steeped in art, history, and culture. I strongly believe in supporting our local artists and musicians, and will take every chance to do so. Whether it is through the activities of the Ah Haa Art School, the summer festivals, or supporting local theatre troupes, I have enjoyed my involvement with the arts community over the years. I am the proud mother of a son Tyler who graduated from Duke University and graduated Emory University and now lives happily in Atlanta, GA with his wife and daughter and son! I look forward to welcoming you to town should you choose Telluride as your next vacation retreat. You are welcome to use me as a resource or simply a travel guide, as I have lived here for 40 years and know every nook and cranny of this charming town. Location, location, location! As a long-time Telluride resident, I recognize the importance of convenience when visiting a new town. No need for a car when you stay at my Coronet Creek condo. Just walk out the door and you are steps from the River Trail which meanders through town to the gondola, Town Park, chair 7 or just a for a stroll. Close to grocer, liquor store, and center of town, this is the place to be. Cornet Creek condos are perfectly situated at the corner of Pacific Ave and S. Davis Street. This very intimate and quiet commercial corner of town offers some of the best conveniences in all of Telluride. Just steps from your front door are the following indulgences; the lovely 'Siam' Thai restaurant, the new and popular 'There' tavern, and the super convenient 'Pacific Street Liquors' for all of your spirit needs. No need to even leave the block. But of course, you should! By the way, Telluride is a very easy and lovely town to explore on foot, or you can always hop on our FREE public bus named the 'Galloping Goose' which also conveniently stops at the Pacific Street corner just steps away from the condo. Amenity size shampoo, conditioner and soap provided to guests of Cornet Condo. Hair Dryers provided. Cornet Creek Condo is located in downtown Telluride only a 3.5 blocks to the middle of Telluride's shopping district and restaurants. Incredible views of Ingram Falls and Telluride's famous box end canyon. Nice dining area overlooking Cornet Creek. Available at Telluride Ski and Golf Resort, only a free 12 minute Gondola ride away. No car is necessary because everything is within walking distance. The free gondola will take you on a 12 minute ride to the town of Mountain Village. You may use Telluride's free transportation via the Galloping Goose which loops through town every 15 minutes, pick up the Goose just steps out your front door. The gondola operates from 7am to midnight daily. Condo was just as described and in a very convenient location. Easy walking distance to restaurants, shopping, etc. and just steps to catch the Village Shuttle. The check in and out process was easy and Victoria was quick to respond to our questions. The unit was perfect. Beautiful light and views! The unit was well situated to everything. We were here for a wedding. Our entire family stayed here and it gave great Space for each person. We had to rent a classical guitar and amp and the town has an excellent store with high end musical instruments. The groceries stores were close by and even in a huge snow storm we were cozy and able to get around well. Close to the Gondola, a wine store, a Thai restaurant the Galluping Goose Shuttle and the slopes! The steam shower was an extra nice feature for stiff bodies and great for sea level accustomed breathers! The parking was great even though we walked almost everywhere. Would rent this unit in any season! We loved our stay! The condo was ideal for our family of five. The location is perfect, Galloping Goose stop right outside the door for trip to gondola or an easy 5 minute walk to Coonskin lift. Main Street (Colorado Ave.) is a block away. Comfy beds, nice linens and plenty of towels. Our kids loved the steam shower in downstairs bathroom. Good location, but the pictures are not representative of actual condition of the condo. Not very well maintained...fire alarm in master hanging by wires and the vent in the upstairs basement is not attached to the ceiling. For all the fuss about taking your shoes off you would expect the carpets to be in pristine condition, unfortunately the carpets are worn and there are existing stains. The first thing we had to do was sweep the deck which was full of debris and clean the patio furniture which is not exactly what you want to do at the start of your vacation. Overall, Telluride is a fantastic summer vacation destination, but this condo left something to be desired. the property is perfectly located. we were able to walk everywhere. we had a wonderful stay. the agent was very helpful and readily available for questions. would recommend this property highly to anyone. In town Telluride location. Easy walking distance to skiing, restaurants, and shopping! No car is necessary.